Christmas decorations—always on display in Italy until at least January 6—have barely been packed away. 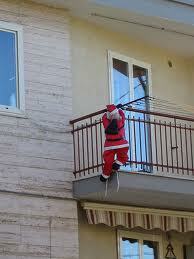 Babbo Natale (Santa Claus) still hangs by his rope ladder from a few balconies. Twinkling lights linger on lampposts here and there, but Italians, adults and children alike, are already preparing for the next celebration—Carnevale. This pre-Lenten ritual offers adults ample opportunities to carouse in Venice or Viareggio. 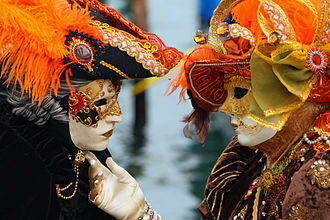 In Venice, adults dress in elaborate costumes and parade among the canals wearing hand-crafted masks. Venetian mask-makers enjoy a rarefied status, and their products are sold year round in alluring shops that invite residents and tourists alike to spend money. In Viareggio, parade floats mirror the artistry of Venetian masks. Originating in 1873, the Viareggio parade, which snakes along the sea, features giant caricatures of politicians, entertainers, and other famous people. No one is immune to being targeted. In both cities, adults party, dance, and drink. Shops have stocked up on bags of confetti (called coriandoli, “coriander”) which little costumed creatures cast at passersby as they charge down the street. That’s the most innocuous of their weapons. Packs of festoni (streamers) hail from almost every shop. Children fling these tightly rolled paper strands along the pavement, too. It’s not uncommon to encounter Tinker Bell, or other characters, with these paper ribbons in her hair. The gutters are full of them on the festival wanes. Streamers are not only the realm of children, however; adults play with them, too. A couple of years ago, I went to a relatively staid event at a restaurant just before Martedì Grasso. While we waited for desert, the hostess distributed festoni, and we tossed them around the room like children—and we weren’t even in costume! But the most nefarious weapon in the children’s carnival arsenal is Silly String. When little tykes are given a can by doting parents, they run around giggling with glee, squirting at anything that moves. It wouldn’t be so bad it they just targeted each other, but they often choose to ambush unsuspecting me. The stuff sticks to the sidewalks, and as Easter approaches, hapless doorkeepers are out with brooms trying to get the stuff up. During the solemn Lenten period, the colored tendrils clinging to the sidewalk gradually wear away from the footsteps grinding them. By the time Spring is in full swing, they have been forgotten. Fortunately, Silly String disappears with Lent, not to reappear until the following year. 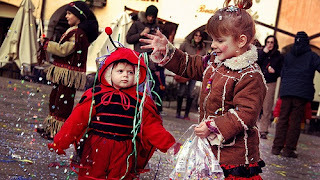 Even on Palm Sunday, the week before Easter, children appear in their Carnevale finery, usually swathed in scarves and woolen hats to stave off the cold. And underneath those costumes, they’ll be bundled in sweaters and undervests. They carry their favorite weapons and battle it out in the piazzas after church. I’m looking forward to watching the children in costume again this year. It’s a rite that proves Spring is indeed on the way. Be sure to follow me at Novel Adventurers on alternate Thursdays. Next week I'm writing about shopping. Your posts are always so lively and fun to read. I love Christmas and listen to classical Christmas music almost every day. It comforts my autistic brain. :) And our live Christmas tree is still up. We're thinking of keeping it up year round but changing the ornaments throughout the year. The tree has already grown about eight inches, so it'll be fun to see if we can still use by next Christmas before planting it outside. Thanks, Carla, for the kind words. Your Christmas tree project sounds like fun. Take pictures as you go through the year. It will be a lovely thing to have in the future. And the tree has grown eight inches in a month! Amazing.